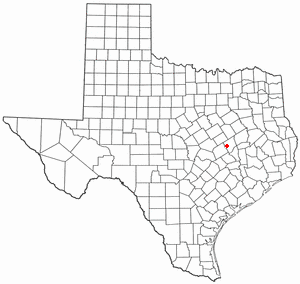 Calvert is a city in Robertson County, Texas, United States. The population was 1,192 at the 2010 census, a 16.4% decline from the 2000 census. It is part of the Bryan-College Station metropolitan area. According to the United States Census Bureau, Calvert has a total area of 3.9 square miles (10 square kilometers), all of it land. The city of Calvert, founded in 1868, was named in honor of Robert Calvert, a descendant of Lord Baltimore. Robert Calvert was a large plantation owner and was instrumental in directing the railroad through Robertson County. In the same manner that the railroad brought prosperity to Calvert, cotton planters (many of whom arrived in the area following the Civil War) established huge plantations with an ambience of prosperity and Southern hospitality. Here's the our members favorite photos of "Cities in Texas". Upload your photo of Calvert!